Garland Independent School District is deploying 100 of Brainchild’s Kineo® tablets across several middle schools within the district to help with ESL programs. Districts come to Brainchild because of our 15 years of experience successfully implementing mobile learning devices into classrooms. Garland Independent School District is deploying 100 of Brainchild’s Kineo® tablets across several middle schools within the district to help with ESL programs. The tablets will be used with Brainchild's Achiever! software for assessment and data-driven instruction on TEKS standards to help ESL students prepare for STAAR testing. Students use the tablets for individualized instruction. Their progress can be uploaded to web-based reports to help teachers and administrators adjust individual and group instruction. When Achiever! is used online, students benefit from lessons being available in both English and Spanish. Garland chose the Kineo tablet for its ability to engage students and work with students at their own pace at different learning levels. Brainchild's remedial software, Mechanics, will be used with select students to help build a basic foundation to fundamental skills needed to succeed at grade-level. “Districts are finding many challenges with implementing a successful mobile learning experience into the classroom. It can be difficult to find the right software applications combined with an effective implementation strategy. Districts come to Brainchild because of our 15 years of experience successfully implementing mobile learning devices into classrooms. We not only provide the Kineo tablets, we also provide the software and professional development to ensure success.” said Brainchild’s vice president, Jeremy Verret. 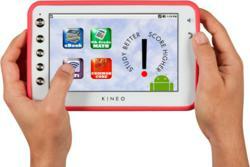 Kineo tablets are specifically built for schools. They have 7” screens with built-in screen protectors, a 10 hour battery, and safety features designed specifically for school usage. They give students restricted access to the Web, Flash capabilities for multimedia instruction, and a choice of numerous eReader programs. Brainchild is a leading provider of mobile learning devices to schools. It has provided mobile learning devices, content, and teacher training for 15 years. Its web-based assessment and instruction programs sync with Kineos to provide reports and maximum access to instruction. Brainchild, Corp. is a Florida-based company for standards-based online assessment, instruction and reporting tools helping students reach and exceed learning objectives. In addition to its Achiever! series built individually for each state, Brainchild also manufactures Kineo® and the Study Buddy, mobile learning devices built specifically for classroom use. Call or click for more information: 800-811-2724 or visit http://www.brainchild.com. Follow Brainchild on Facebook, Twitter, and YouTube.